I'll start with the disclaimer this is another bit of kit courtesy of a very kind Phil and I have no vested interest in the sleeping bag other than to share my views on it. These are my intital thoughts having carried and used the Therm-a-Rest Haven top bag once on an overnighter at the end of January. Phil had let me know in advance that he would have this bag, the Therm-a-Rest Haven would available if I wanted to have a go. He had indicated on twitter a few days before that the bag was a bit small for him. With me not being shy and an official small person, I jumped at the chance to test some gear out. Knowing this I had a quick google at the sleeping bag. I was intrigued by the concept. The bag has no zips and an elasticated hole in the back as well as a couple of straps to attach it onto a mat. It comes in a Pewter grey color and is filled will 700 goose down. The shell fabric is Nylon Ripstop with a DWR finish and it's lined with Nylon Taffeta. Looking then; that night, at the photographs it would seem that you can insert a sleeping mat into the Haven or strap it down to mat (a Neo-Air) on the website. All very interesting. When Phil first handed it to me in the car park at Ballantrae it was in the big storage sack that it comes with and I really didn't have a proper look at. Phil and I talked about the no zips and the straps. That it was rated down to -6C which would be plenty for that particular Saturday night in January. I run warm anyway and the old adage is true for me, you heat the sleeping bag the sleeping bag doesn't heat you. Nothing to worry about there. I also said that I reckoned there was a couple of ways to insert yourself into the bag having seen the website but maybe not if you're a 6' 2" Phil. It went from the storage sack in to the stuff sack. I remember thinking it felt nice and soft as I stuffed it. At the time I wasn't sure of the size but having measured it once I got home, it measured in at 27cm x 18.5cm and weighed about 638g 668 grams in the stuff sack on my scales. With the stuff sack weighing 20 grams on it's on. Less than half the weight of the synthetic bag I usually carry, nevermind the difference in stuff sack size. In the Alpkit rucksack it went and that was the last I thought about it until we were pitching the tents. Once the tents were pitched and I had inflated my sleeping mat, a POE Ether 6. I got out the Haven to let it breathe and loft after being squashed for most of the day. I gave it a good shake out and it lofted well and there is left it until after dinner. This was where the fun began, trying to figure out the best way to use the Haven. I started off with inserting the Ether 6 and sliding in up to my oxsters this was fine while I was lying about talking to Phil over in his tent but when it came to bed down for the night. I found even for me; it was tight, me in the fully inflated Ether 6 inside the Haven but I was willing to give it a go, for a while at least. That lasted until I tried to turn on to my side. Too tight with POE pad. I decided that this was probably the best time to take a leak and then come back and sort it out. By that time I think Phil was already in the land of nod so I tried to be as quiet as I could. Once back in the LiteHouse Solo, I removed the POE and straped the Haven down and got myself back into the bag through the elasticated hole in the back. Much easier way in than through the hood, rat up a drainpipe experience of earlier. However i think that had a lot to do with the sleeping pad being inside that bag. Now much more comfortable in the Haven, with plenty of from I settled down for some sleep. Ten minutes later I found myself having to strip off, down to my underwear and my baselayer. I found the bag to be warm and cosy. A lot warmer than the synthetic bag I was used to. At that time of year I would usually be sleeping in my clothes. Comfortable again, I drifted off to sleep but a few hours in I found myself waking because of a cold spot. My bum was straight onto the sleeping mat because of the elasticated hole. That hadn't happened when the mat was inside with me. After much fiddling and rumbling, I tucked one edge of the hole under me and that removed the gap enabling to get a good sleep the rest of the night. It's a curious design in that it has no zips an well elasticated hole in the back and a couple of straps with clips to attach it to the mat of your choice. I'm not sure how much weight you save by not having a full length zip. I suppose the grams are a bit like pennies in that if you look after them the pennies will take care of themselves. 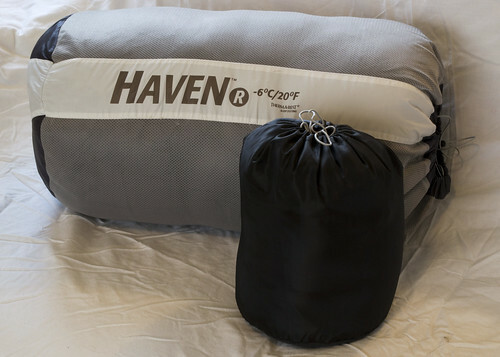 I have no real complaints about the Haven sleeping, the pocket was too small to be of much use to me. Not sure what you would use it for. I judge these things on can I store my glasses safely. Which I couldn't. The cold spot, maybe but it could have just been the wrong mat. Having check up on a few things when I got home. Therm-a-Rest recommend using a tappered matteress like their TrailPro when the weather is cold. This still of mat would allow more room when inserted in and more than likely eliminate the cold spot but I managed to sort that for myself. Maybe that's my next move get hold of a tappered mat and try it with that. All in all I had a very good sleep in a very decent sleeping bag and I'm looking forward to testing it again.